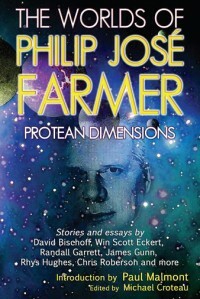 On June 26th, at FarmerCon V in Seattle, Washington, Meteor House released its first book, The Worlds of Philip José Farmer 1: Protean Dimensions. Edited by Michael Croteau, this new anthology is a tour through SF Grand Master Philip José Farmer’s many creations, featuring essays by the likes of Randall Garrett and James Gunn, interviews with Farmer, stories set in Farmer’s expanded worlds by Chris Roberson, David Bischoff, Rhys Hughes, and other SF/F talents, and previously unpublished fiction and more by Farmer himself. The Worlds of Philip José Farmer 1: Protean Dimensions, the first in an annual series, is currently available in a trade paperback limited to 500 numbered copies. Please click on through for more information.